Over the past few days, I rolled quite a few blossoms to make some cute, little girl bands. I bought a pack of hairbands at wally world for about $4 and then the two packs of felt cost $8 and I still have a lot of felt left. It is therapeutic to roll these little sweeties and I enjoyed coming up with the color combos. I hope our little friends like them. Haven is figuring out how to climb up on things. She climbed up her playset ladder all by herself and she launched herself into the dry tub yesterday. She wasn't very happy about that. Here she figured out that the bathroom stool can be moved around the house and used to get what she wants. Oh boy! I love drawing and most kinds of art related things. I realized the other day that I hadn't drawn Haven yet. So, I fixed that problem with some sidewalk chalk. I practiced a few times to get her face shape right and then I just had to take a picture because the rain will wash away this sweet, huge face. We love welcoming Daddy home in the afternoons. Haven also found a fun, new spot to play. I took the lid off of her cube and she climbed right in. -I got crafty with felt. The tutorials can be found here. - we went to the zoo. 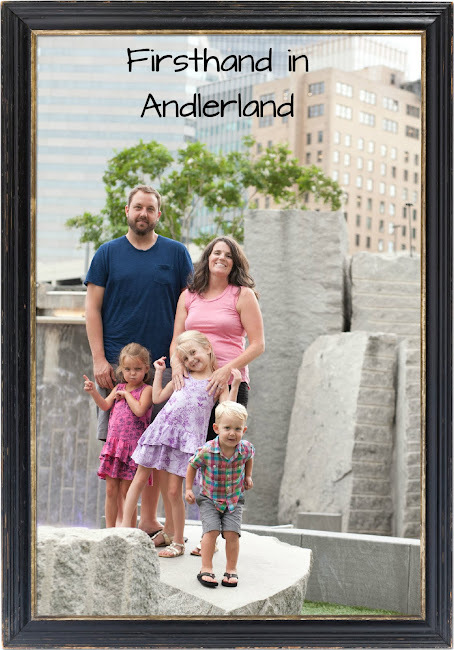 We met a few college friends and their kiddos at the Asheboro Zoo for hot, fun day. -looked at farm animals at VBS. -celebrated Jeremy receiving his award of "best father in the whole world." Haven trying out her new/old desk that Grammy bought her. This weekend Haven had her first homemade popsicle. I mixed up vanilla pudding with pediasure to give her a few extra calories. As you will see, she enjoyed it thoroughly. Our awesome neighbors gave us a playset that their little girl doesn't play with anymore. Haven has been playing on it for months now in their yard and we moved it to our yard this weekend. Oh, what fun we will have! Haven had this little hole/pore on her ear at birth. It was the first thing we noticed on her perfect skin, except for those two hairy things over her eyes. Yes, she has beautiful, arched eyebrows and yes, they were there at 32 weeks gestation. Anyway, my sister told me that the hole/pore thingy had a name, so i googled and found out it is a little more than just a pore. Amazing. Most things I read said they are hereditary, so I wonder if anybody else in our families has one. This is known in the biz as a "preauricular pit." For the sake of orientation, here's a bit of anatomy: the outer rim of the ear is called the helix. The area where the helix is attached to the face is known as the helical root. 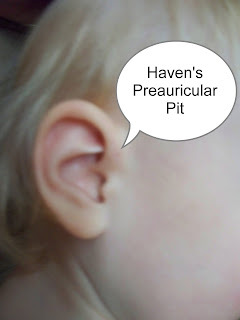 A preauricular pit is a tiny (1 to 2 millimeter) hole in the skin of the helical root. Pits are present at birth; they form during early fetal development. 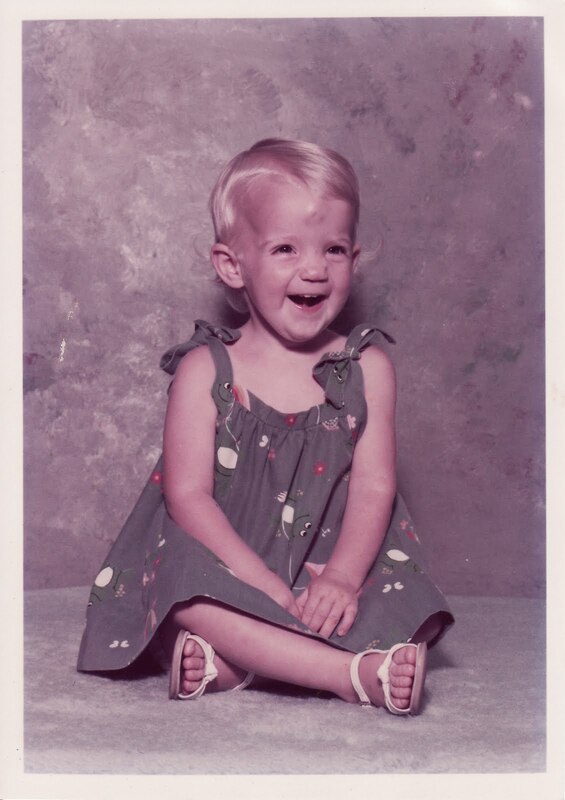 In the 5th to 6th week post-conception, 6 tiny lumps of tissue begin merging, and by the 20th fetal week, these lumps have formed the external ear. If this process is something less than perfect, any number of external ear anomalies may result. 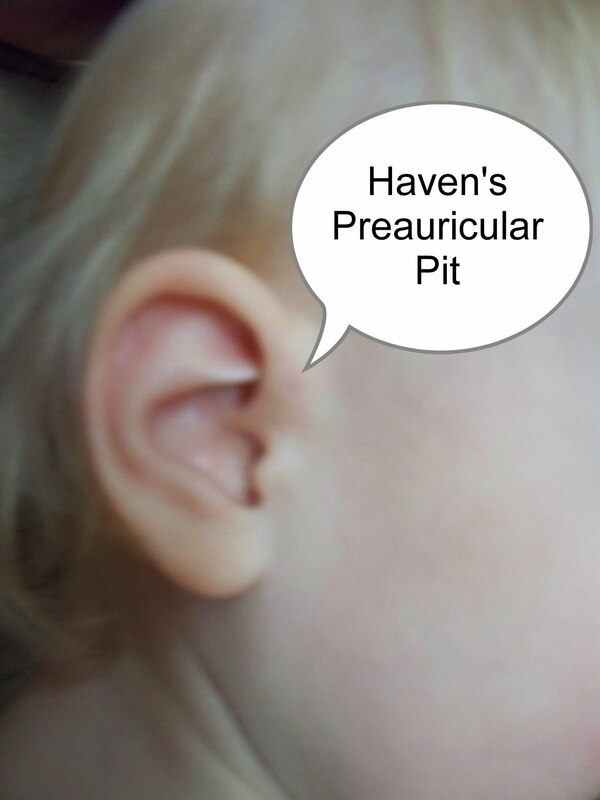 Preauricular pits are (arguably) one of the milder anomalies that may result from imperfect external ear development. They are skin-lined and are typically less than one inch in depth. Pits are significant for two reasons. First, pits can become infected. An infected pit usually presents as a soft or hard swelling at the helical root; press on the swollen area, and a drop of pus will emerge from the pit. This can be treated with antibiotics, of course, but if the pit keeps getting infected you would probably want to have it surgically removed. This can be done under local anesthesia. You must make sure that your surgeon is familiar with pits. Simply excising the outer (visible) portion of the pit is inadequate; the surgeon must excise the entire pit. An ear, nose and throat surgeon would be the best choice for this procedure, since we all have experience with pits. Pits are also significant because they can be an indicator for other ear problems. In other words, there is a higher-than-chance association of pits with other (less visible) ear anomalies. These "deeper" anomalies are important because they usually impair hearing to some degree. You may or may not have noticed such a hearing loss; the loss may be mild, and may easily have gone unnoticed on school audiograms. I got crafty again this past week and had lots of fun. I have loved vinyl for a while, but finally ordered some of my own. It was my first time applying it, so it isn't perfect. It definitely adds another element to our room for the summer. I made Jobe and Jonah, our new twin cousins, tie shirts. Aren't they cute? Emelia, our new neighbor baby, was born last week and she needed a birdie. 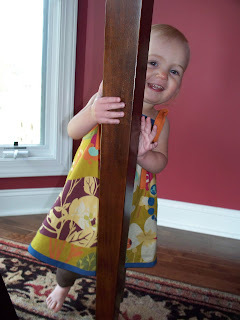 While I had my sewing machine out and the pattern cut, I went ahead and made Bethany this John Deere dress. She looks super cute in it, see? This little girl is 1 1/2 years old. She is full of energy and super sweet. She is cautious yet silly. Adamant yet polite. Her new thing is to yell,"MA-MA" when she wants a snack and it is loud and drawn out. She is still shy of 19 pounds, but fiesty as ever. 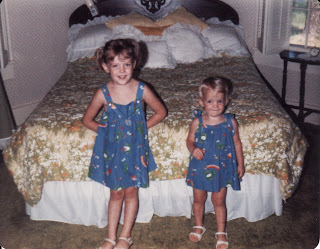 Here I am, in July of 1982 at 19 months, wearing my frog shirt that Aunt Shelby made for me. Wendy must have been four years old here. Here is Haven wearing the same shirt at almost 18 months.